Well, it was either that or 'Metroidvania'. 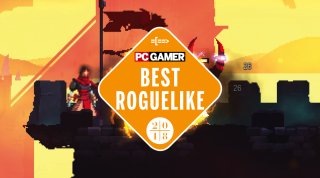 The third of our GOTY awards goes to Motion Twin's excellent combat-heavy sidescrolling game, Dead Cells. Check out the rest of our awards and personal picks in our GOTY hub. Phil: I'm not usually a fan of roguelikes that demand I spend time unlocking persistent skills to progress. I prefer the Spelunky method, where I don't technically need anything to complete the game, but will still throw myself against it hundreds of times, learning and improving as I go. If I'm going to die in roguelike, I prefer it be because I screwed up, not because I haven't yet unlocked the weapons and upgrades I need. Despite this, I love Dead Cells, in large part because its combat is so good. It's satisfyingly technical, forcing you to learn attack patterns and special abilities. And executing the perfectly timed strikes and dodges required to efficiently and safely progress remains fun, even after tens of hours. Its weapons keep things interesting, too, with lots of interesting quirks designed to tempt you away from your preferred loadout. Temptation, and the risks and rewards that come with it, are the key to any good roguelike. Steven: How does another 2D Metroidvania roguelike even make it onto one of these lists in 2018? That's the kind of cynicism I brought to Dead Cells when I first started playing it—and it only took a few minutes to see why everyone won't shut up about this game. Dead Cells is just too damn good. The combat is great, sure, but what I really dig is the sense of exploration and how Dead Cells forces players to juggle survival, exploration, and speed all at the same time. Some of the most powerful items are behind doors that will close after a certain amount of time has passed, so once I discovered one I'd dedicate a whole run just to getting there as fast as possible to grab the item before the door slammed shut. Those runs are my favorite, because I couldn't afford to be careful and slow. In those frantic sprints, there was no room for error, and that was completely thrilling. Bo: When I started playing Dead Cells, I would die in seconds. Then my skills improved, and runs would last minutes. Then I learned enemy strategies, and unlocked some useful gear. Now I barrel through early levels, taking on ever more challenging hordes. An hour deep into a run, death is agony, but it still never stops me wanting to immediately start again. Tom: I remember playing Dead Cells for the first time at the PC Gamer Weekender a year or so back, and the moment I started playing I knew I’d end up putting dozens of hours into it. The pixel art is beautiful and the controls are quick and crisp. The colour-coded upgrade system is so easy to grasp it takes the edge off the unusual progression system, which asks you to pour cells into unlocks that may or may not appear on future runs. The first four or five hours can be rough, but when Dead Cells opens up you’re consistently powering into later levels and casually besting enemies that once seemed unstoppable. Want more words on Dead Cells? Check out our original review from earlier this year.